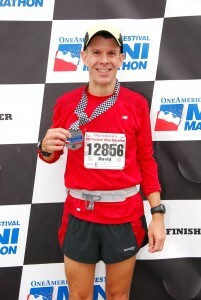 Goal for the 2012 Carmel Marathon Championship: Finish in less than four hours. Why I started running: I saw a picture of a friend on Facebook who had not gained any weight since high school and decided to get off the couch. I lost more than 30 pounds and have kept it off for nearly two years. Favorite place to run in Carmel: Clay Center Road as part of my long runs through several neighborhoods, and anywhere I can see wildlife. I have seen foxes, coyotes, owls, hawks and deer on runs in Carmel. I run with: Usually solo, or with my cousin Patrick Withered, or members of the Carmel Runners Club. When I’m not running: I practice law in Carmel with Drewry Simmons Vornehm, LLP, spend time with my family, walk or run with our dog twice a day, enjoy the outdoors – especially national and state parks – and attend sports car and open-wheel races. Advice for new runners: Start slow and run short distances so as to gradually build a base and not injure yourself. Go to a running store and have them fit you for shoes by running on a treadmill or outside. It takes less than 30 minutes to get a good workout. Mix up your routes and try some trail running for some real fun!